Mulbarton is a small parish to the south of Norwich. The village of Mulbarton grew up around a common that still dominates the centre of the village that has grown in size in recent years. Mulbarton comes from the Old English meaning ‘an outlying farm where milk is produced’. The earliest evidence of occupation in the parish dates from the prehistoric period and flint flakes (NHER 29342, 37187), Neolithic flints (NHER 9489), a Late Neolithic or Early Bronze Age scraper (NHER 37179) have been collected. A Late Bronze Age spearhead (NHER 28679) and a socketed axehead (NHER 28851) have been found by metal detectorists. The cropmark of a ring ditch (NHER 9752), probably dating to the Bronze Age, is visible on aerial photographs in the north of the parish. 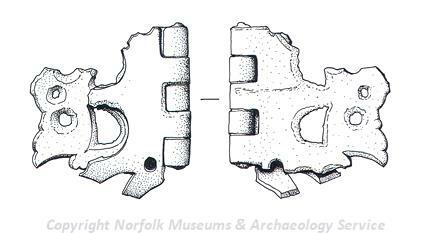 The only evidence of the Iron Age is in the form of coins (NHER 30022) and an Iron Age or Roman brooch (NHER 37179). Although no Roman settlement sites have been identified, extensive metal detecting has recovered evidence of Roman occupation in the parish, including Roman coins (NHER 9490, 28851, 28929, 29090, 29254, 33082, 37179), fragments of pottery (NHER 28851, 28929, 29343), a brooch (NHER 29342, 29343) and a hinged military belt fitting (NHER 37187). An Early Saxon iron spearhead (NHER 9491), brooches (NHER 29092, 37179), a strap fitting (NHER 29092), a Middle Saxon brooch (NHER 28851), a Late Saxon brooch (NHER 28929) and box mount (NHER 29358), and a lovely example of a Viking sword pommel decorated with copper alloy wire and animal interlace (NHER 29342) have been found during metal detecting. The Domesday Book records Mulbarton as a relatively large holding, with a mill, woods, meadows and livestock. St Mary Magdalen’s Church (NHER 9520) has a 14th century west tower and late 19th century alterations. The church contains an interesting memorial to Sir Edwin Rich who died in 1675. The medieval village of Kenningham (NHER 10106) was in the south of the parish, near Kenningham Hall. The parish of Kenningham was united with Mulbarton in 1452, and the parish church (NHER 9765) was demolished before the Reformation. The village itself was gradually deserted during the medieval period, and by 1452 only a couple of houses remained. Slight earthworks of medieval house platforms are now the only traces of the village. Kenningham Hall (NHER 19477), which stands near the site of the medieval village, has a timber framed wing that dates back to the 17th century that is attached to a large 18th century brick block. The Old Hall (NHER 9503) is a 16th or 17th century timber framed house that stands on a medieval moated site. The house has original mullion and transom windows, an original winding stair with two balusters and some of the timber frame is visible on the interior. 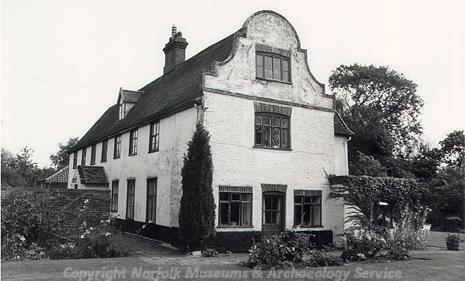 The Malt House (NHER 19478) also dates to the 16th or 17th century, and is built on a lobby entrance plan. Paddock Farmhouse (NHER 14212) is an early 17th century house, surrounded by a complex of farm buildings including two 17th century barns and an 18th century barn. In the grounds of the farmhouse are various examples of imported Roman statuary, including part of a Roman marble sarcophagus, a column base and an inscription that could be part of a funeral stele. The World’s End pub (NHER 44670) also dates from the 17th century with later alterations. The Old Rectory (NHER 41249) is a 17th century timber framed wing attached to a large 18th century brick block. The barn (NHER 41250) close to the Old Rectory dates from the 18th century and has now been converted into a house. Old Rectory Barn (NHER 14213) is an early 18th century brick barn that is attached to a 19th century coachman’s cottage, now known as Old Rectory Cottage. Mulbarton Hall (NHER 9525) is an 18th century hall with symmetrical 19th century side pavilions with pyramidal roofs. The main block has a slightly advanced central section with a pediment and a central pedimented door. The Lodge (NHER 44668) is an 18th and 19th century house with a central porch flanked by Ionic columns. The Old Forge (NHER 44669) is an early 19th century smithy with two forewings with pedimented gables that form a courtyard with the main wing. Dairy Farm Barn (NHER 44665) dates from the early to mid 19th century and is built of cob, which is an extremely rare building material to find in East Anglia. A post medieval windmill (NHER 9519) is shown on Bryant’s map of 1826 and was last used in 1908. A post medieval smock mill (NHER 15552) is shown on Faden’s map of 1797, and was struck by lightning in 1910. Sarah Spooner (NLA), 7 July 2006.